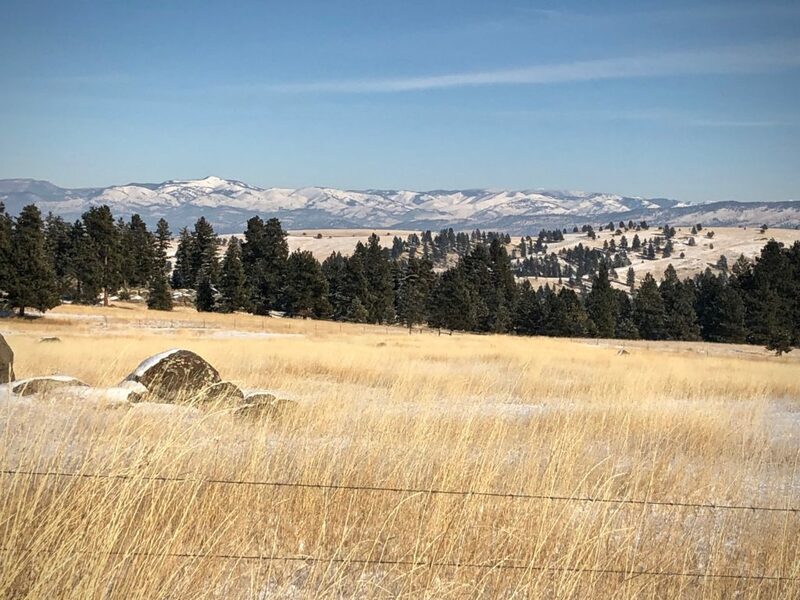 Montana is beautiful, with snow-capped mountains and big-sky sunrises! It’s there that I took Joanne Hall’s fantastic drawloom class last week. 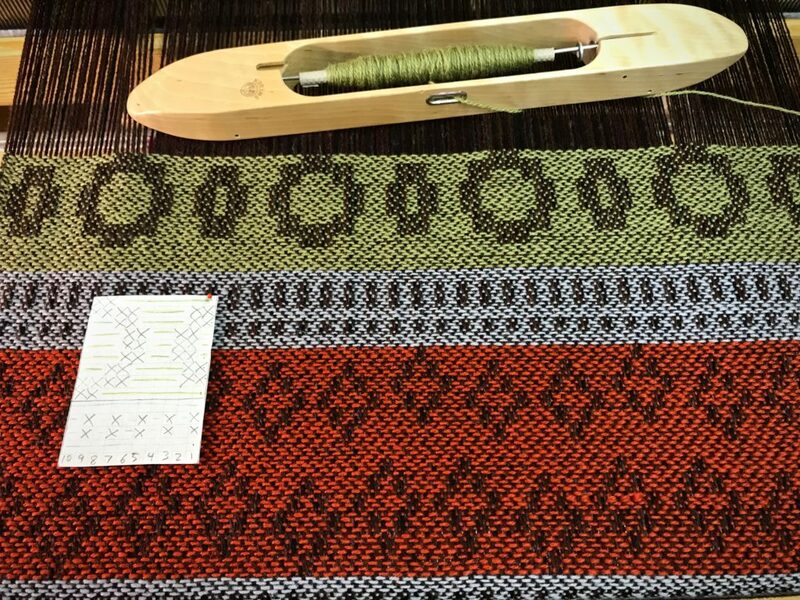 My confidence level about setting up and weaving on my drawloom shot up 100 per cent! (And Steve got to experience fishing on the ice with Joanne’s husband Ed!) Please continue all the way to the end of this post to read about submitting a question for Joanne to answer. View from Hall Lane, in front of Joanne and Ed’s home. 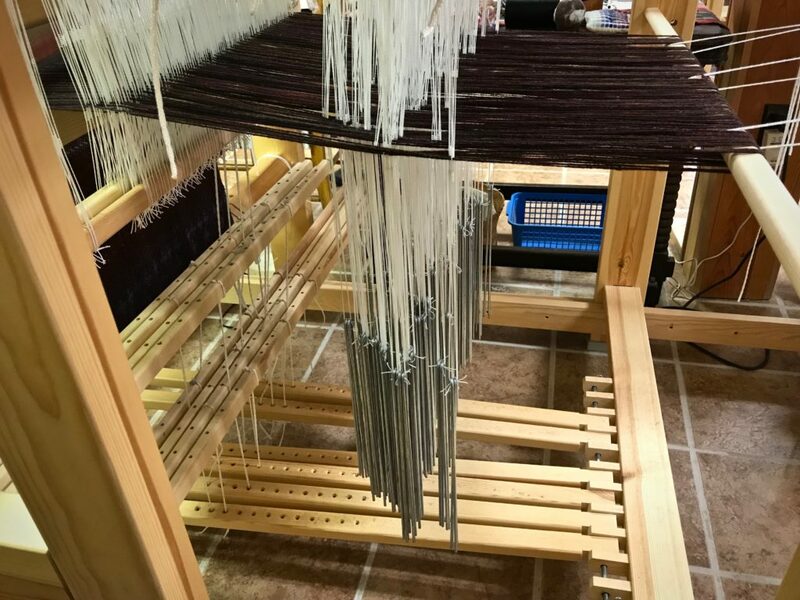 Cathleen and Deborah and I wove on the shaft drawloom, the single unit drawloom, and the Julia loom set up with half-heddle sticks to weave opphämta. What joy! …even in the challenges of learning new things. 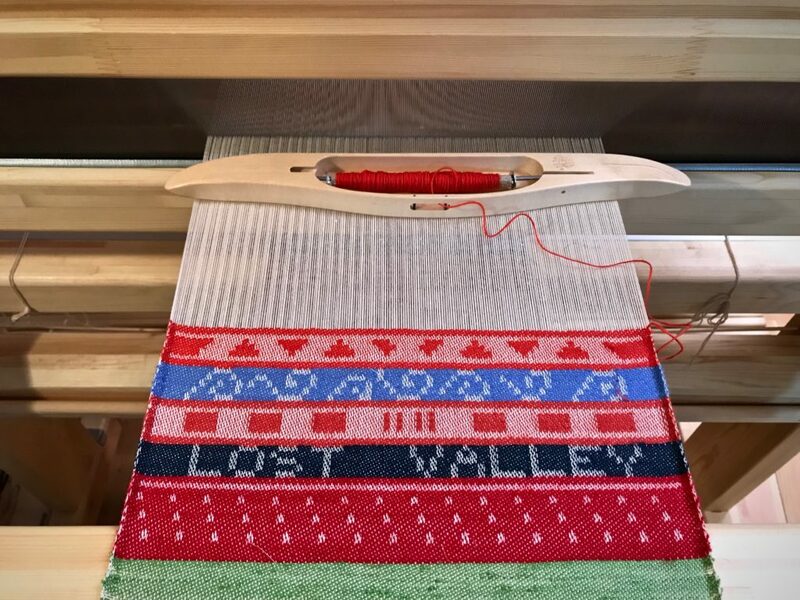 Single unit drawloom has the capability of weaving imagery, and even words, like “Lost Valley,” the name of our Texas hill country home. 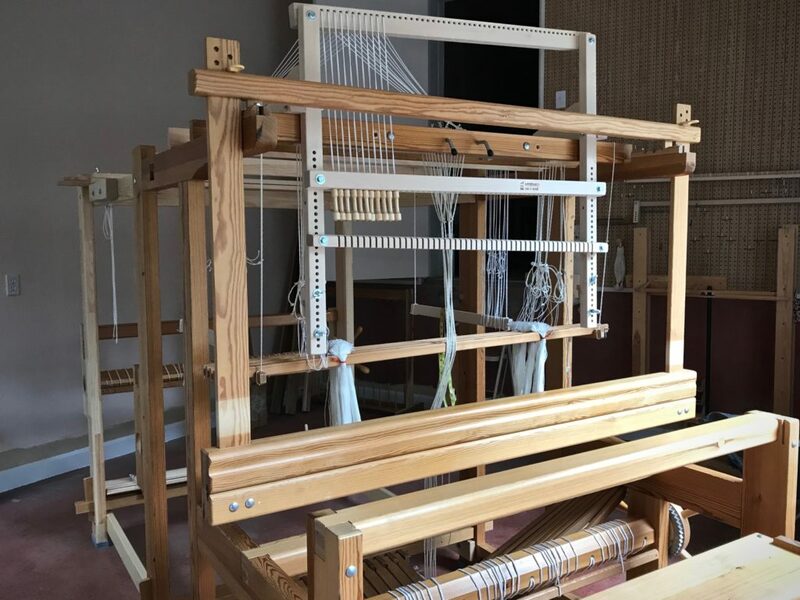 Single unit drawloom in Joanne Hall’s weaving studio. 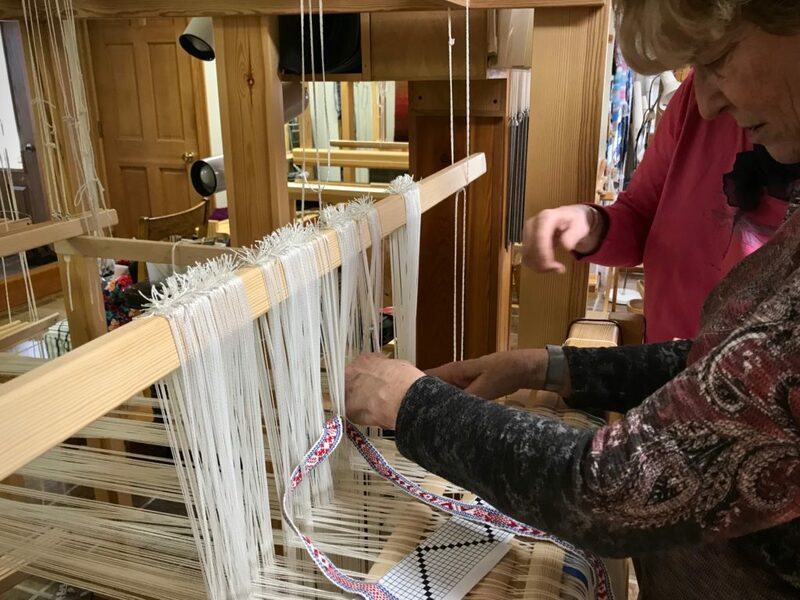 Joanne demonstrates how to use half-heddle sticks and shows us some opphämta samples. Pattern has Xs that show where to pull the shaft draw handles. The red dot of a straight pin keeps my place as I follow the rows from bottom to top. Pulled pattern shaft handles are secured in the hook bar. Normally, one two-ounce U-shaped weight hangs on each pattern unit. In this case, with 6/2 Tuna wool, two weights hang on each pattern unit. 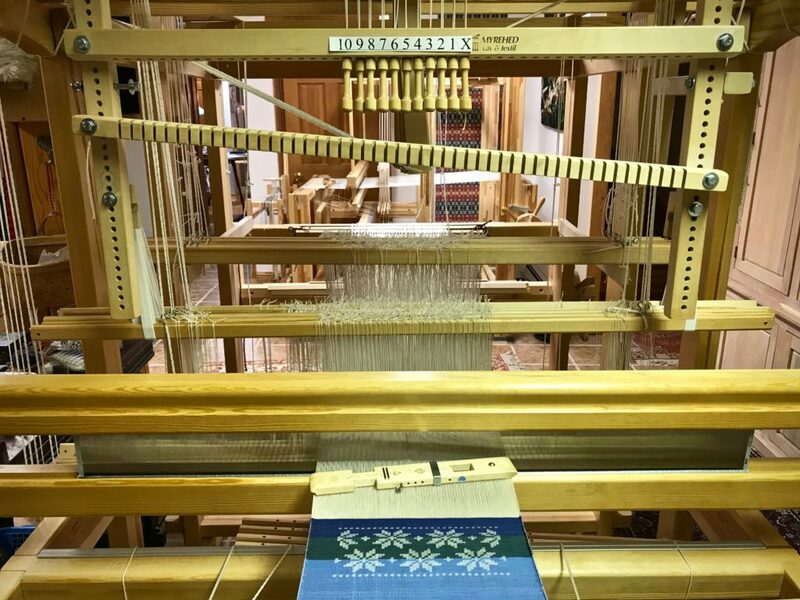 Wool yardage and samplers are unrolled and cut off the 120cm Glimåkra Standard loom. Oh, the colors and patterns! Joanne taught us how to understand patterns and drafts, and how to make our own patterns. And we dressed the drawloom—we threaded pattern heddles and ground heddles, and distributed pattern shafts. Boy, did we students make mistakes! But with quiet Joanne, there is always a way to fix anything that matters. She is a picture of grace. Deb separates pattern heddles that will be placed on the next pattern shaft. After undoing some beginner errors, we finally have all the pattern heddles in order (pointed threading) on the eleven pattern shafts. 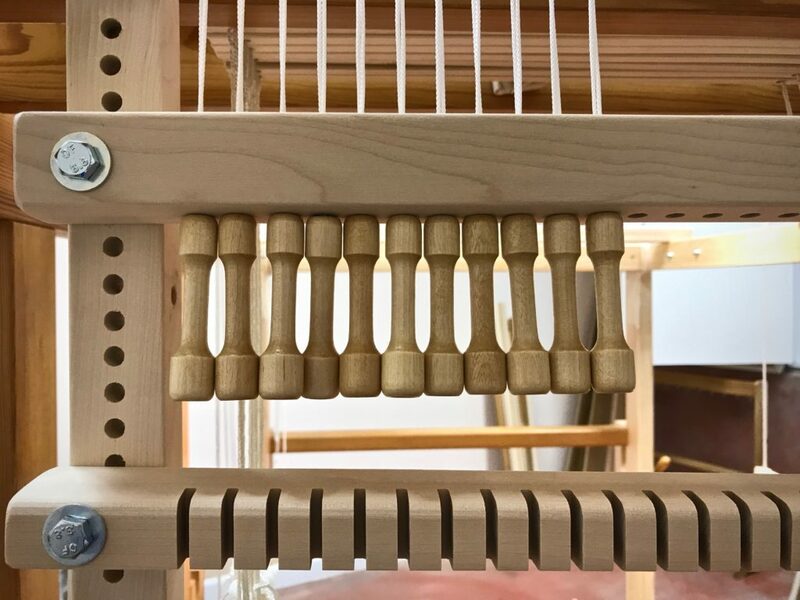 One weight hangs on the long heddles of each six-thread pattern unit. In the loom together! Karen (me), Cathleen, and Deborah enjoy the expertise and kindness of Joanne. 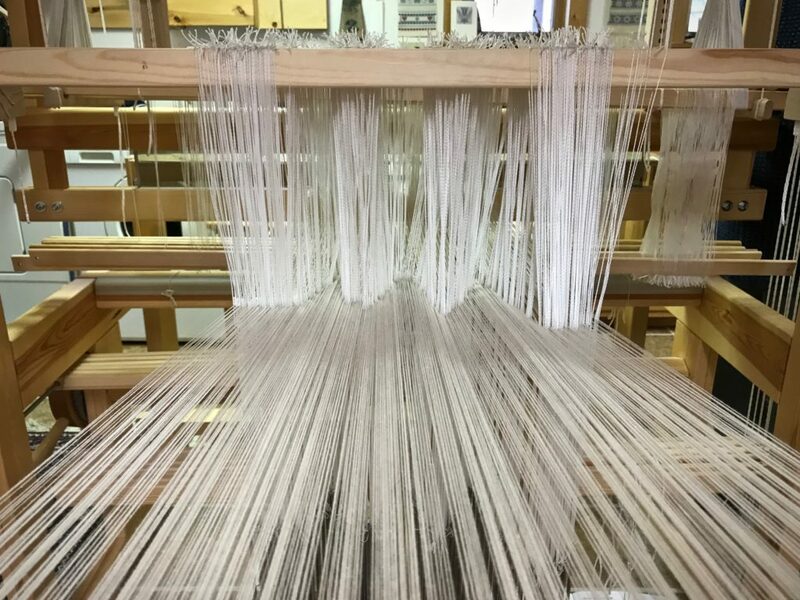 New 16/2 cotton warp on the shaft drawloom. I emptied a few quills to weave the traditional eight-pointed star pattern. Meanwhile, Joanne watched treadles, lamms, and shafts to fine tune the sheds. Everything is just right! Striving to look good to other people, we face unwelcome judgment. Striving to please ourselves, we face demands of perfection. But when our heart strives to please the Lord, we receive grace. Our failures fade in importance as our confidence in his faithfulness grows. Know who you are working for. The imperfect images we weave in the cloth are a humble gift of gratitude back our Grand Weaver. Wool shaft drawloom sampler, at home now in my drawloom studio. Reverse side of wool sampler was face up on the loom. Single unit drawloom sampler. Our Lost Valley home, with details that remind us of our 2018 transition year. Draw cords and handles are in place. Forty more will be added soon. Shaft drawloom is ready. Single unit drawloom parts will be added later. Please excuse me now while I go wind a warp! May your imperfections be greeted with grace. 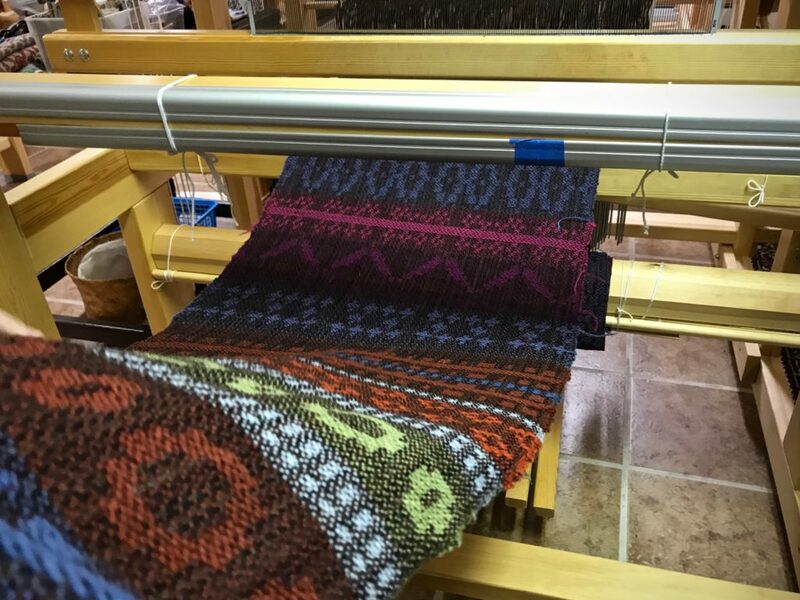 Are you curious about drawlooms? 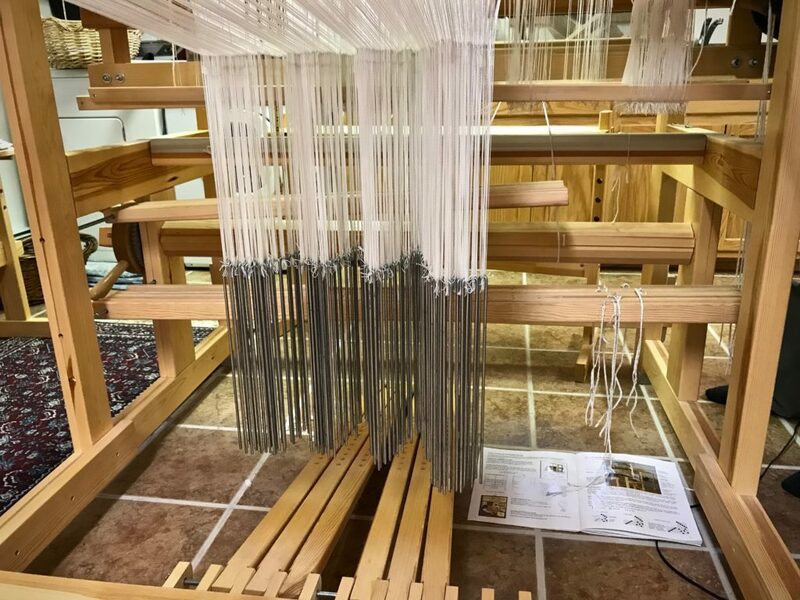 Are you considering a drawloom for yourself? Do you have a drawloom and wish you could ask an expert for help? 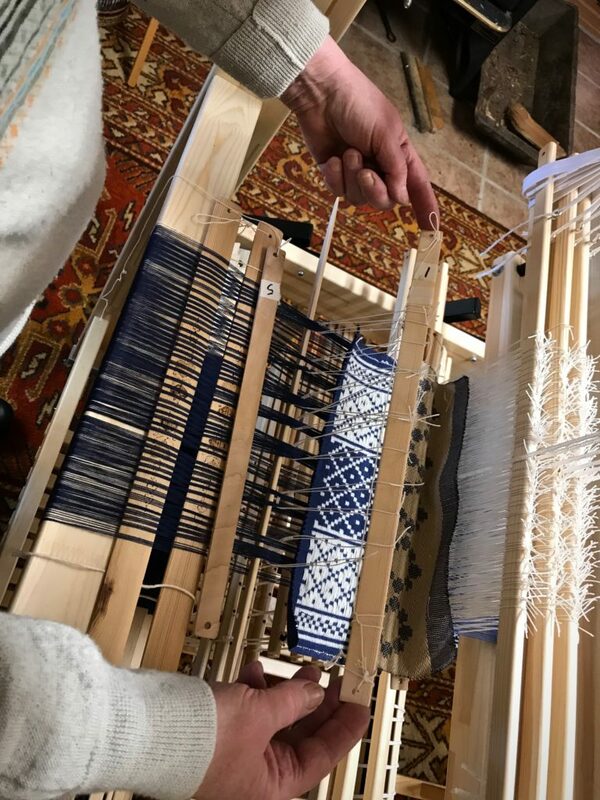 Please put your question about drawlooms and/or drawloom weaving in the comments below, or send your question to me through Get in Touch. Joanne Hall’s answers to two selected questions will be included in next week’s post. Please submit your question by this Friday, February 8. Oh, how lucky you are! I am searching for the loom, then take her class. It seems to be taking forever!! Hi Nancy, I know what you mean. I searched for quite a while, too, to find a loom. And then, all of a sudden, at just the right time, there it was! You have a lot to look forward to. Karen, my brain tingles at all the learning you did last week! The picture of Montana way lovely too, but I added to that my knowledge that it was bitterly cold in that part of the country! Have fun playing with your drawloom when you get set. Hi Marilyn, So much learning! Hopefully, the important parts will stick with me. It was cold, but we didn’t get the bitter Artic cold that some places were getting last week. I think they got some of that right after we Texans left. Whew! The draw down loom is something I did not know existed. At first glance, confusing. As I continued reading, exciting. I look forward to your adventures. Hi Nannette, It has taken me a while to peel off the confusion about drawlooms. I think I’m beginning to understand how they work. I’m super excited to get the whole thing set up! Amazing! The complexity and beauty and feeling so empowered to make beautiful textiles. Hi Shari, It seems complex until you start to understand it. It’s really pretty simple—just sticks and strings that do specific things. 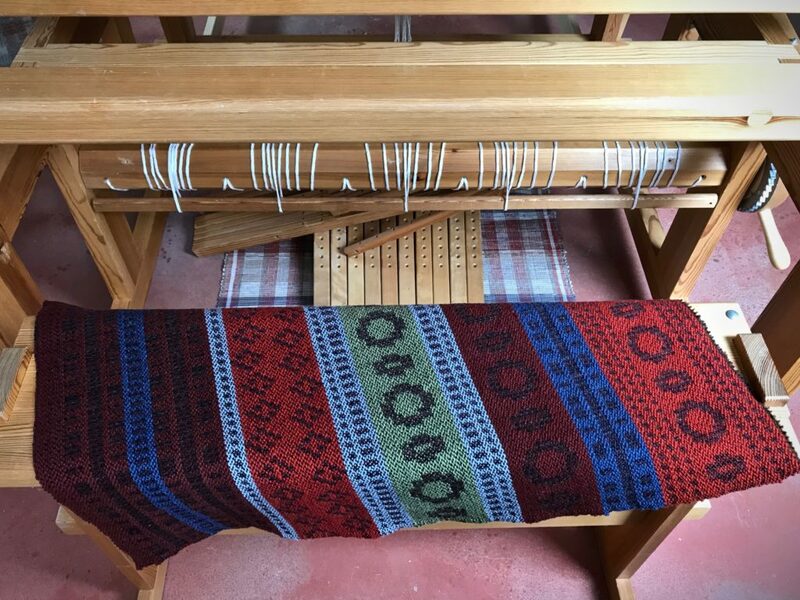 It opens up a world of beautiful weaving! I am so happy you got your drawloom, and that you were able to take Joanne’s class this soon. 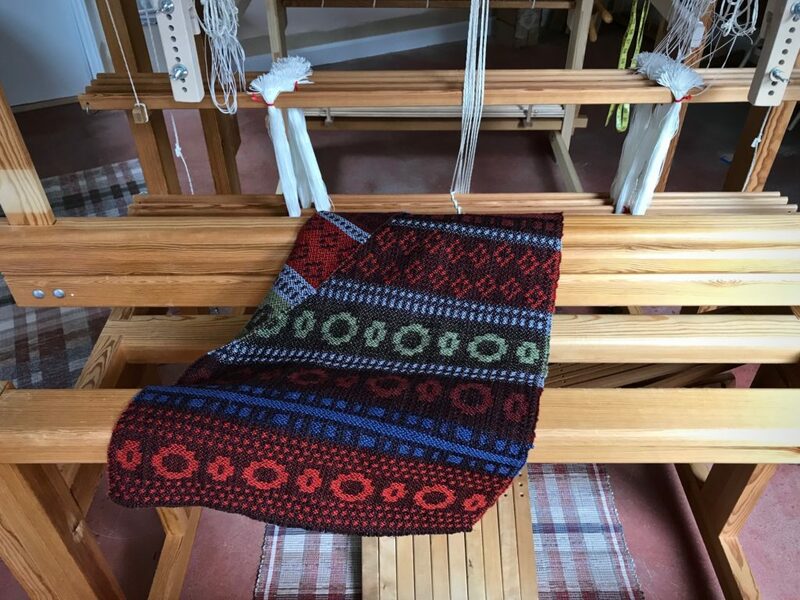 Your weaving journey har been amazing, and it is such a pleasure to be invited into your weaving world through your blog! Hi Elisabeth, I feel very fortunate that the timing of everything has worked out so smoothly. 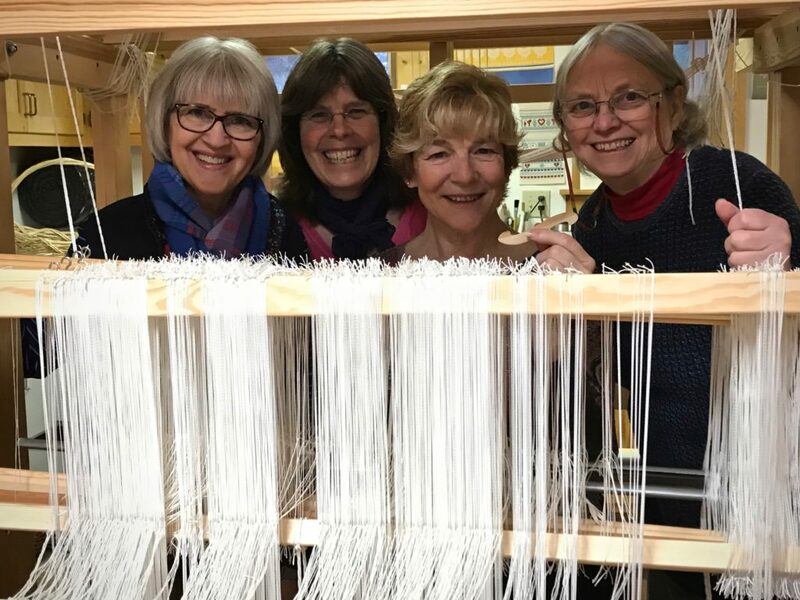 It’s wonderful to get to share my weaving journey with friends like you! I enjoyed seeing the pictures and reading your commentary, Karen. Is that your drawloom in the last photos? 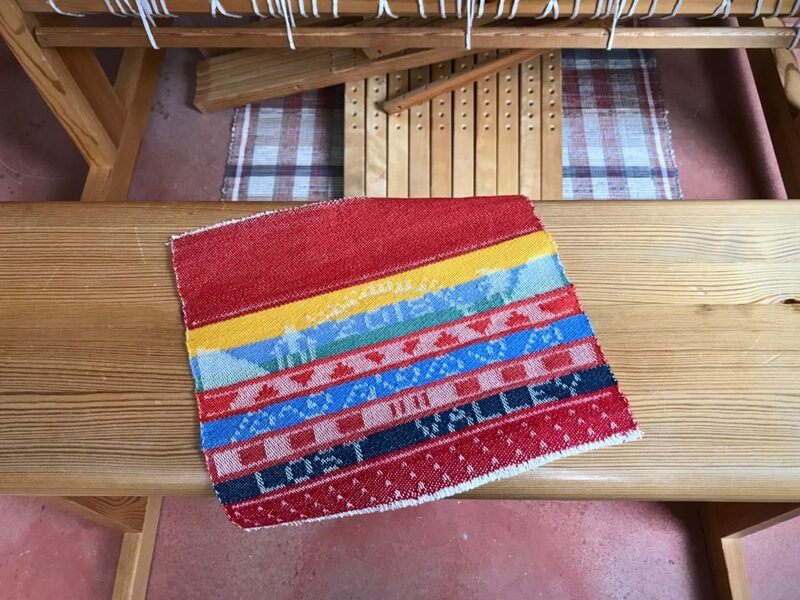 Have a wonderful time learning and weaving, and thanks for sharing your journey. Hi D’Anne, Yes, that’s my drawloom in the last photos. It’s almost ready to weave! I’m so excited to hear about your recent trip, Debbie and I are headed there in April and I can’t wait!! Hi Janet, You are going to have a fabulous time! I’m excited for you! Thank you for sharing your experience and photos. Beautiful work. I am heading out there mid April and so looking forward to it. 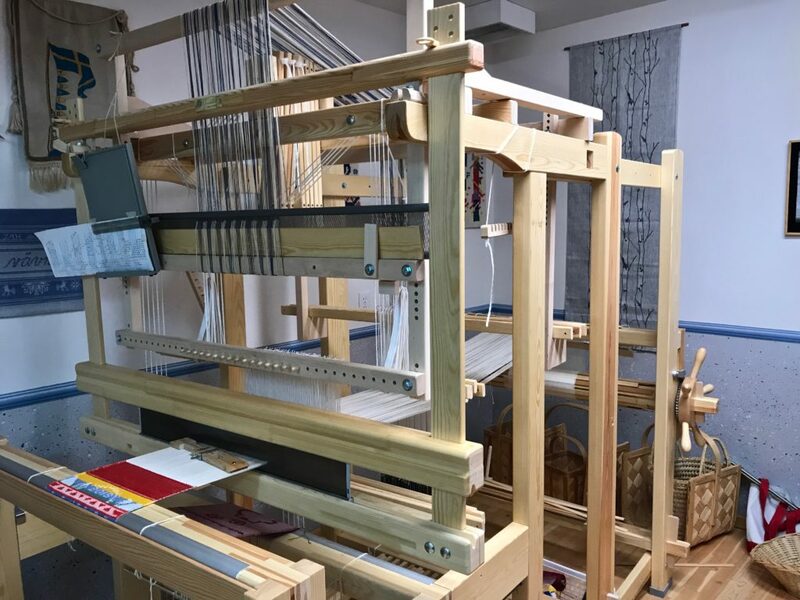 For some unexplainable reason I am so drawn to the big Swedish looms and the drawloom. I have an older Glimakra standard in storage and getting time with kind Joanne and the class I will know if it’s something for me or not. I will likely be less experienced than the other participants and your last paragraph is a reminder to not compare myself or lack of expertise but to enjoy. 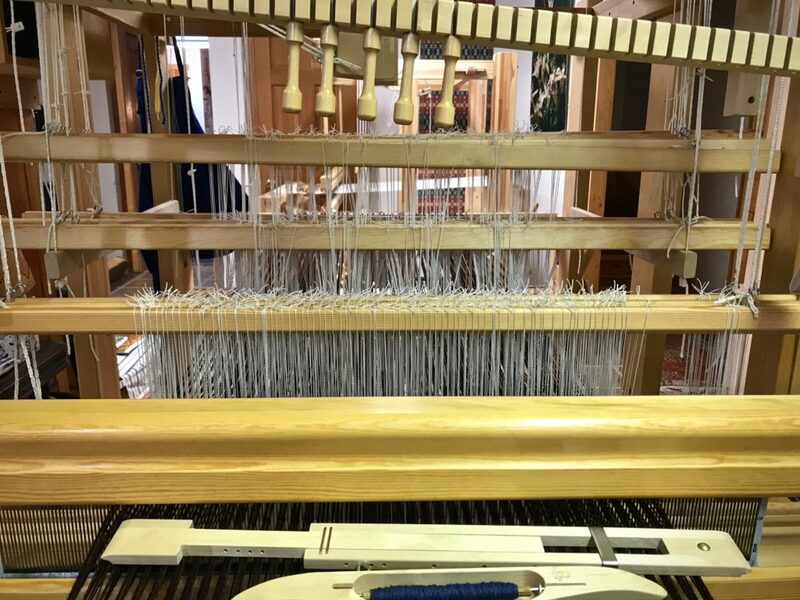 Hi Denise, Since you are drawn to the big Swedish looms, I am confident that it will be a great joy for you to weave on them. I’m excited for you! Your class with Joanne will be just what you need! No need to worry about lack of expertise. Just go with an attitude willing to learn. Enjoy!